Staff photo by Hannah LaClaire Helayne Talbott listens to proceedings during the Monday Nashua Board of Education meeting. Officials hired her to serve as principal of New Searles Elementary School. 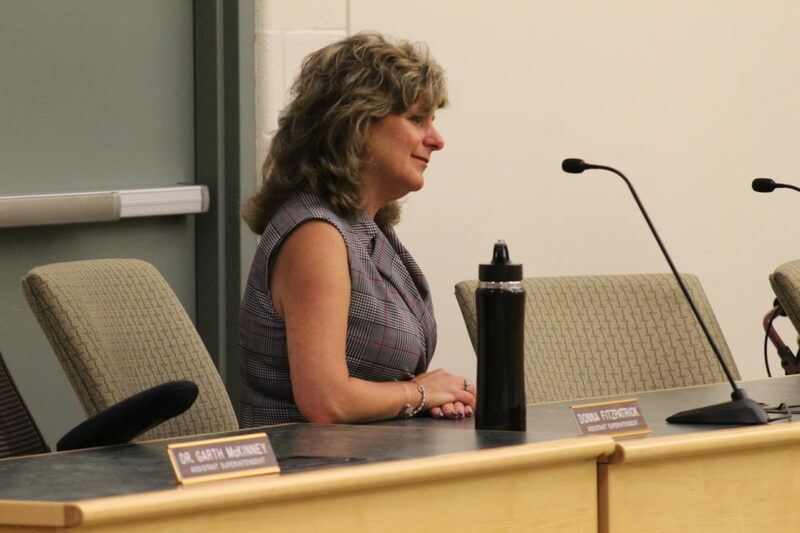 NASHUA – Helayne Talbott performed multiple duties during her 15 years with the Nashua School District, but after the Monday Board of Education meeting, her new title is principal of New Searles Elementary School. Named just two weeks before the start of the 2018-19 school year, Talbott’s salary is listed at $98,750. Although she studied education in college, Talbott did not start her career in the field. Instead, she worked in the computer industry for a number of years, but eventually found her way to a child care center in the mid-1990s. After that, Talbott said, she quickly knew her initial instincts were correct and that education was for her. She traveled to multiple areas, helping to set up successful child care centers and working at Nashua Community College as an adjunct professor, teaching early childhood education. Then she started teaching in high school and fell in love with it, she said, and stayed in the position for three years. However, Talbott “likes to be active,” and enjoyed a more administrative role. She covered briefly for a headmaster who was on leave and then worked as one herself for a number of years. She became the assistant principal at Fairgrounds Middle School three years ago. During Talbott’s interview, board member Gloria Timmons complimented Talbott on her work at Fairgrounds, sharing that her grandson had said that Talbott was the only administrator to whom he could really talk. Elizabeth Van Twuyver, board member, asked Talbott if it would be difficult for her to not be as close to the students as she once was. After her official interview, Talbott said she was excited to get to know the community. “New Searles is a well-established, happy school,” she said, adding that sometimes there can be even more pressure going into an environment where things are going well. Her job as a mom has helped her be more understanding with other parents, Talbott said.